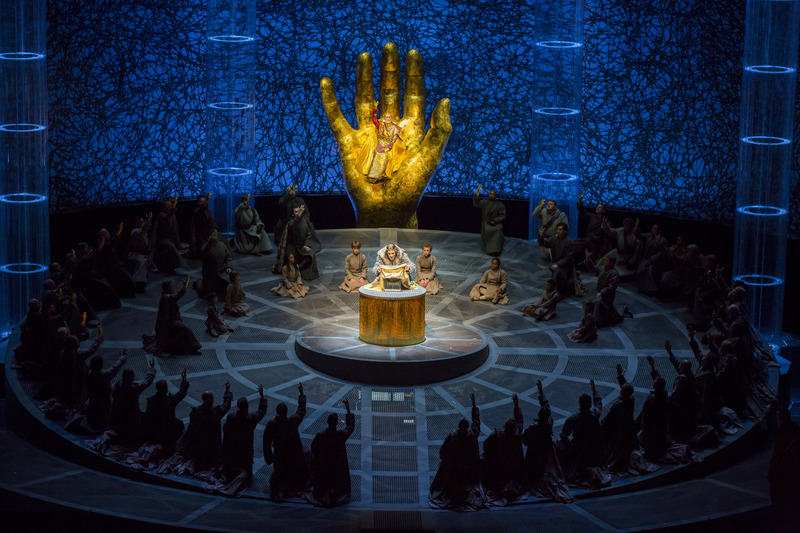 Kudos to Lyric Opera for celebrating the Wagner bicentennial by bringing us Wagner’s last, most glorious and perhaps most controversial work, “Parsifal, ” in an all-new production for the occasion. This is an opera unlike any other: Wagner himself called it a Bühnenweihfestspiel, or consecrated stage work, and specified that it not be performed outside of his own theater in Bayreuth and without applause. These wishes were encouraged by Wagner’s widow Cosima well into the twentieth century although a handful of early concert versions and unauthorized productions managed to appear nonetheless. 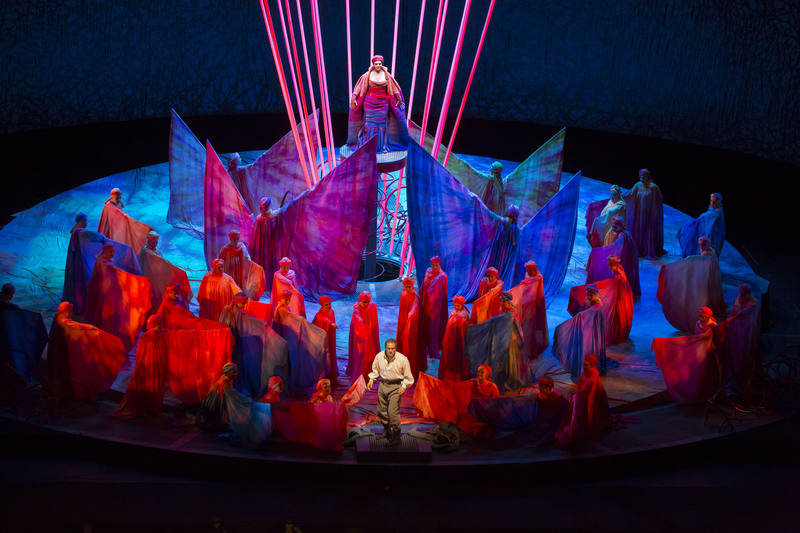 In the case of Lyric Opera, “Parsifal” had only been presented twice in the company’s nearly sixty-year history before the current production, which much as Nikolaus Lehnhoff’s contemporary sci-fi production had done in 2002, largely demythologizes the work of its Christian context. In “Parsifal,” the only work that followed after the completion of Wagner’s massive four-work “Der Ring des Nibelungen” on Norse mythology, Wagner had, as Nietzsche so infamously put it, “fallen at the foot of the Cross.” Many of Wagner’s greatest devotees were puzzled by “Parsifal,” typified by Debussy’s reaction that from a philosophical, aesthetic and moral point of view, the piece was utterly abhorrent to him, and yet he frustratingly found himself drawn in because it all sounded so beautiful. Indeed, the music of “Parsifal,” some of Wagner’s most emulated, has always held sway with its grandeur, lushness and pageantry. Happily, it is in good hands in this production under Sir Andrew Davis, who has deepened his understanding of the score since his first-ever “Parsifal” conducted here in 2002. Davis’ tempos are often brisk, but convincing. Aside from a faltering trumpeter who was having a very bad evening on opening night, the orchestra plays with aplomb. The chorus too, under new chorus master Michael Black distinguishes itself even if sometimes its backstage placement in some of the scenes makes it difficult to hear during some crucial moments. As for the singing, the best of the evening comes from Korean bass Kwangchul Youn, making his Lyric debut in one of his signature roles, that of Gurnemanz, the principal story teller of the opera. He is resonant and lyrical as well as dramatic and received the largest ovation at opera’s end opening night. Both Parsifal and Kundry are role debuts for tenor Paul Groves and soprano Daveda Karanas respectively, huge gambles for a work as gargantuan as “Parsifal” that, unfortunately, do not pay off. In fact, Groves, who is singing his first-ever Wagner role, seems to have neither the heft nor the range at present to make the switch to heldentenor and often struggles to be heard as well as to reach notes, at least on opening night. Karanas, who is making her Lyric debut, is at least audible but often forces out notes in the upper range, often quite unpleasantly. Their Act II duet is a difficult audible experience. Baritone Thomas Hampson also seemed to be having a bad opening night as Amfortas, one of his signature roles. His acting was way over the top and his voice sounded pushed. Icelandic baritone Tómas Tómasson is an effective Klingsor and Faroese bass Rúni Brattaberg, making his Lyric debut, singing the role of Titurel quite well from offstage while a super mimes the role. As for the production itself, British director John Caird, best known as a stage director, is making both his Lyric debut and his first foray into Wagner. One of those directors who feels that there needs to be constant movement on the stage, even during the moments where the music needs to take center stage, his staging concepts are often a distraction to the music rather than an enhancement of it. Some of his ideas are solid in themselves, but are awkwardly executed. One notable exception is the clever way that this production deals with Parsifal’s killing of a swan, gracefully performed from a trapeze by Leah Khan, who later makes a climactic and effective apparition. South African set and costume designer Johan Engels certainly deserves much credit for designing imaginatively contrasting worlds in the production, an earth-toned Monsalvat for Acts I and III and a neon-red world for Klingsor in Act II complete with flower-maidens that are almost painfully florescent. It does suggest that evil and temptation are more eye-popping and colorful than the gray, everyday world of the Grail which of course, is in direct conflict with what Wagner spells out musically. Rather than a recognizable Grail, the sacred object looks more like a candy dish and the throne for the Grail King is an enormous golden hand that moves the iconography of the piece far away from a Christian context and is more suggestive of a galaxy far, far away. In fact, the most “Christian” image of the production, ironically, is when Klingsor is left messianically impaled like a Sacred Heart image at the end of Act II. All of this might be much more interesting if there was a single vision being communicated, which perhaps will come in time. For now, the elements come across as fragmentary rather than unified. Lyric Opera of Chicago at the Civic Opera House, 20 North Wacker, (312)332-2244. $34-$244. lyricopera.org. Through November 29.